As much as I love Heston Blumenthal, he isn’t exactly a minimalist type of cook. I suspect old Hesto would rather quit cooking all together than try making good food with just 5 ingredients. So it may surprise you that today’s recipe was inspired by Heston. The original recipe is for broccoli, but as I’ve learned with a bit of experimentation, it is a wonderful way to cook most other vegetables as well. Step 1. Heat a large fry pan (preferably with a lid) on your highest heat for 3-4 minutes. Step 2. Rinse and chop up the veg while the pan is heating. Step 4. Stir, add a splash more water (Heston adds butter here which can be lovely too). Cook for a further 2 minutes with the lid on. Taste veg, if it needs more time, leave it for another minute or so. Why is it such a good method for cooking veg? Well firstly, it’s quick because you’re using both direct heat from the pan and the steam trapped under the lid. No waiting around for water to boil. But the best part is that the bits of veg that are touching the pan get all lovely and charred and smoky, while the bits on top go lovely and tender and steamed. So overall you end up with way more interesting flavours and textures than if you simply steamed or nuked the veg. What types of veg can you use? Broccoli was my first introduction to this method but since then I’ve had success with cauliflower, chinese broccoli, spinach, kale, and bok choy (recipe below). And I am planning to try it out on green beans, asparagus, zucchini, red capsicum (peppers), fennel, even snow peas. The only things I’d probably avoid are root veg. Although for something like carrots, where I’m happy to eat them with a little crunch, it might just work. After embracing soy sauce as my favourite secret dressing ingredient, I was only a matter of time before I branched out to miso. Such a wonderful ingredient for adding savouriness and all round deliciousness. Here I’m using a little miso in a dressing with balsamic and olive oil. I just love how the sweetness of the balsamic and the salty miso work together. A great little dressing on cooked veg, it’s also lovely as a robust salad dressing and also works well as a sauce for chicken. I’ve served this as a side to roast chicken. But you could also make a meal out of it but tossing in some roast nuts or a few chunks of avocado. Leftover chicken is also lovely. Feel free to take this method and apply to other veg. I can’t wait to get some decent asparagus to try. And you must give it a go with broccoli. So good. 1. Heat a large frying pan (preferably with a lid) on your highest heat for 3-4 minutes. 2. Rinse bok choy well and slice the stems about 1inch across. 4. Stir, add a splash more water. Cook for a further 2 minutes with the lid on. Taste veg, if it needs more time, leave it for another minute or so. 5. 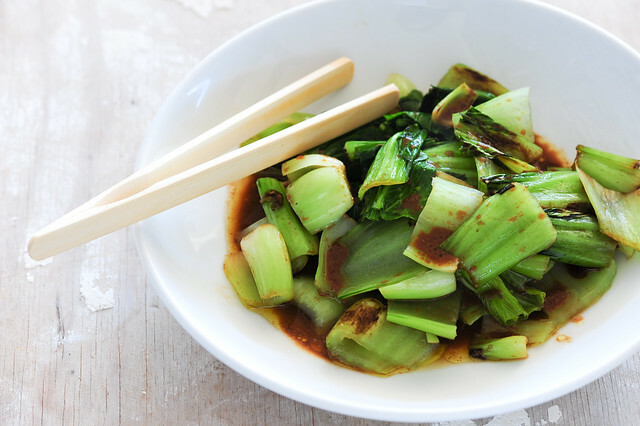 While the bok choy is cooking whisk together miso, balsamic, 1 tablespoon water and 2 tablespoons extra virgin olive oil. Taste and season if needed, but usually the miso is salty enough. 6. 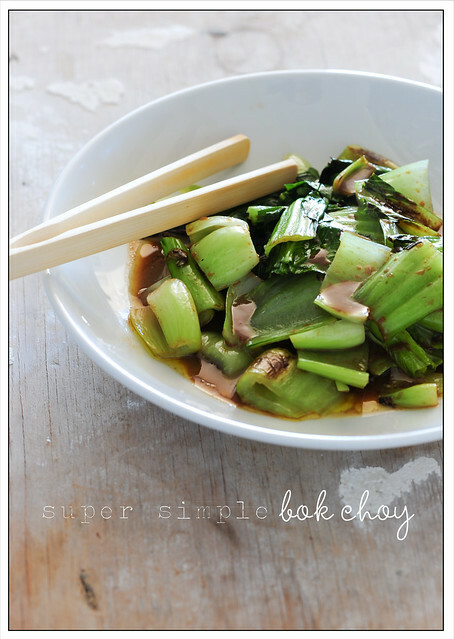 When the bok choy is done place on a serving plate and drizzle with the dressing. And a big big THANKYOU for all the lovely birthday wishes. I had a really lovely day and am now the proud owner of the worlds best watering can. I also really appreciated all the people who supported Stonesoup made the most of my birthday sale. THANKYOU again. I’ve tried this with capsicum, zucchini and green beans and it works a treat! As a dressing I’ll usually just squeeze over some lemon juice, salt and pepper, which seems to cut the smokiness. Very tasty veg. lovely recipe! gonna try it soon. That’s how we cook most of our (Andhra – Telugu) curries. Unless it’s a member of the gourd family (squashes in America, I think), when it goes into the pressure cooker along with the rice and lentils (in separate dishes). Then we add tempering of some mustard seeds, bengal gram, fenugreek, curry leaf, asafoetida, red chilis. I’ve been cooking many of my vegies this way since reading your previous post on Broccoli, it’s been a game-changer for me, just love it! Glad you’ve been enjoying it Erin! Wow, I would never have thought of using this method to cook a veggie currry… you’ve given me a brilliant idea. Thanks. And I love the sound of your tempering as well.. do you fry the spices and curry leaves in oil and serve them on top of the curry? I love miso on bok choy. i have never tried mixing it w balsamic, sounds wonderful. To avoid a trip to the store, I applied this method to the only vegetable I had left..a beautiful bunch of celery. It was divine and I didn’t even bother with dressing. Much nicer texture/flavor than steam or stir fry. Wow I would never have thought to try celery.. what a clever idea! I’m trying to make this work, but the broccoli keeps getting burned. The first time I tried, I almost caused a fire when pouring the (olive) oil into the pan. Any tips? The broccoli is meant to get burned in places… or charred. It’s important to make sure your lid is tight so it keeps in the steam and prevents total incineration. Adding a splash of water at the beginning will help as well. If your oil is almost causing a fire it sounds like your pan is too hot to begin with. It’s meant to smoke but not combust – try starting things before the pan gets so hot. This is the main way Asians cook greens besides blanching or boiling in soups. To add more flavour, chop some garlic and ginger and fry in the hot oil. As Jules says, don’t let the oil get too hot. Add the garlic and ginger when its just starting to smoke. If the smoke is billowing, it’s too hot. Turn off the heat and let the pan cool down. Start again. Once you’ve got the garlic and ginger lightly browning (not black), add the greens. Wait 10 sec and then toss. Add salt and some water, put the lid on and let it cook until tender, but not soggy. Toss halfway through cooking. Very nice post. I just stumbled upon your blog and wanted to say that I’ve truly enjoyed browsing your blog posts. After all Iâ€™ll be subscribing to your feed and I hope you write again very soon! I have now tried out this method of cooking veg and for one can say that it’s very good! Me and girlfriend have used in numerous times to cook veg for veg only meals or for meals to go with meat or other foods. For anyone interested we grow our own veg in our garden and have regularly bought seeds and feeds from http://www.glogrow.com. I just tried this and when I added the oil to the hot pan, it caught on fire…big time! I used olive oil…could that be the problem? Olive oil shouldn’t have caught fire.. unless the pan was way way hot. Next time preheat the pan less. Hope your kitchen is OK! Thanks for the reply Jules…the pan was pretty damn hot so that must have been the problem then! My kitchen survived, haha! :) thanks again! This is just not the first of your reports I’ve read, and you simply never cease to impress me. Thank you, and I await browsing more. Hi, where do you get your miso from? Going to try this with some bok choy today. Thanks for the inspiration! I would also point out to some of the previous and future readers that olive oil isn’t meant for high heat. Try butter, coconut oil, or peanut oil – or look up other oils meant for high heat. There are several.